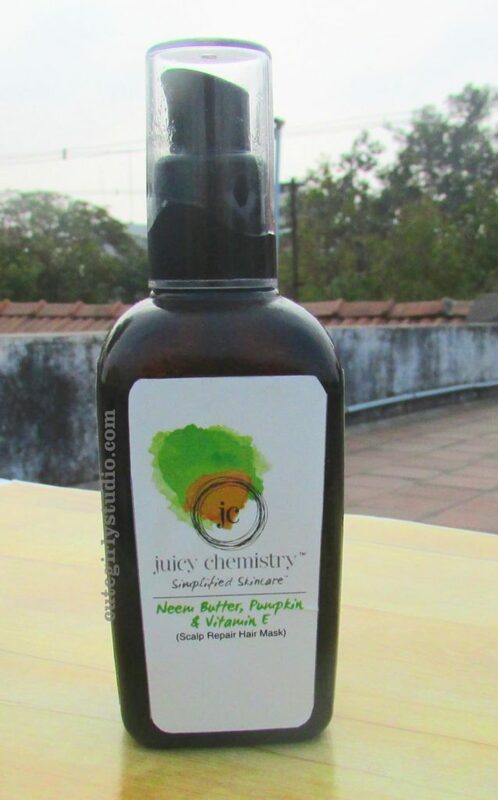 Today’s post is a review of Juicy Chemistry neem butter pumpkin and vitamin E scalp repair hair mask. This is a new addition to their hair care range, I purchased this hair mask a few months back when this mask was a newly launched product. I have emptied this mask last month and realized I haven’t reviewed this hair mask and hence this post. 850 INR for 75gm. You can buy this here. The hair mask comes in an amber coloured glass pump bottle. When the weather is cold outside, the oil thickens up and it becomes difficult to dispense the product. Overall I liked the packaging. 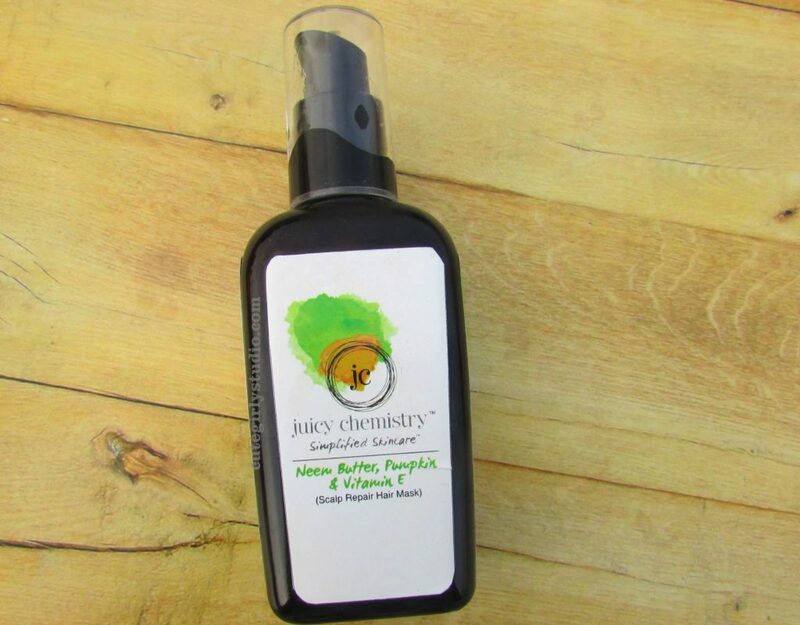 Juicy chemistry neem butter pumpkin and vitamin E hair mask is slightly thick oil with a slight green tinge. It is on a slightly heavier oil side. The fragrance is strong, with mostly tea tree and rosemary notes; but not overpowering. 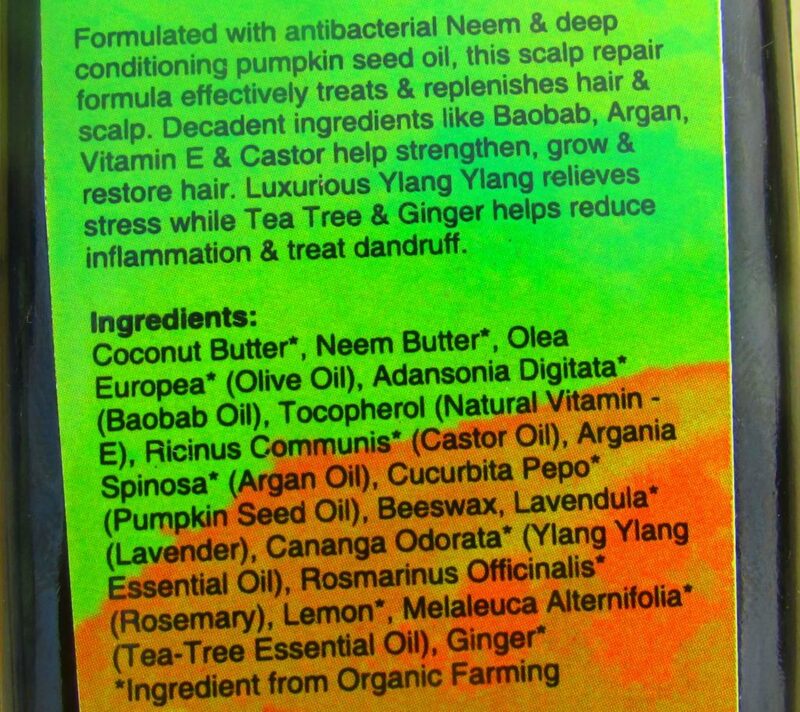 I always use Juicy chemistry neem butter pumpkin and vitamin E hair mask on my scalp and argan and mango hair masque on my hair lengths. Though this hair mask seems to be heavy, it gets washed off easily. After continuous usage, this hair mask definitely reduced itchiness on my scalp and controlled dandruff to some extent. But once I stop using this my scalp gets itchy and flaky. This is great soothing and moisturizing hair mask. This is a decent hair mask that keeps your scalp healthy as long as you use this product. Other than this I don’t have much to say about this product. Yes, if you have mild dandruff and looking for a product that is not harsh on your scalp.